Police in South San Francisco on Sunday were searching for a vehicle and driver involved in a fatal hit and run of a woman late Saturday night. 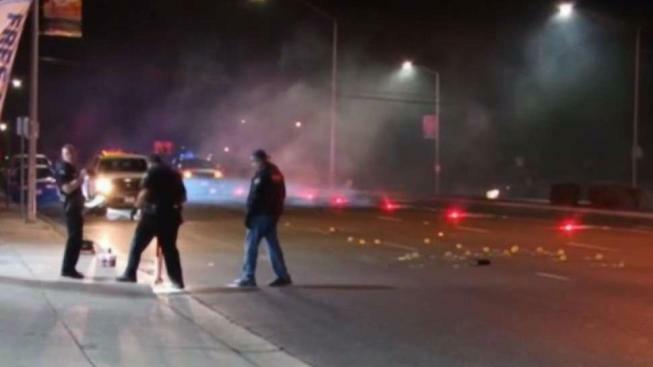 The driver of what is described as a black 1998 to 2000 Toyota or Lexus passenger car struck a female pedestrian along the 200 block of El Camino Real just before midnight and fled the scene, according to police. The victim, identified as 44-year-old Teresa Gonzales of South San Francisco, was taken to a hospital and later pronounced dead, police said. She was a single mother of two daughters, according to family. Police on Monday released a description of the driver based on witness statements. The suspect is described as a white male in his early to mid-30s, about 5 feet, 9 inches tall, weighing about 220 pounds, with a pencil mustache and a short, faded haircut, police said. He was last seen in the area of the 1100 block of Cherry Avenue in San Bruno. A makeshift memorial was growing at Brentwood Bowl, where Gonzales attended a friend's concert, according to Raquel Duran, a close friend. When Gonzales decided to go home, she called an Uber, Duran said. When the Uber driver arrived, he parked across the street, and Gonzales ran toward it. That's when another vehicle struck her and sped off, Duran said. The driver has yet to be found, police said. The suspect car likely sustained minor to moderate damage to its hood and right section of its front end. Friends could not understand why anyone would hit a person and leave them to die. They vowed to help find the person responsible. "I will never stop; anybody in this neighborhood that knows me, knows that I mean that," friend Mike Frye said. "I will make sure that we catch whoever did that. That woman did not deserve to be left in the street like that." Gonzales' family started a GoFundMe campaign that had collected more than $3,000 of a $10,000 goal as of Sunday night. Anyone with information is asked to call the South San Francisco Police Department at 650-877-8900, leave an anonymous tip at 650-952-2244 or email tips@ssf.net. NBC Bay Area's David Gonzalez contributed to this report.